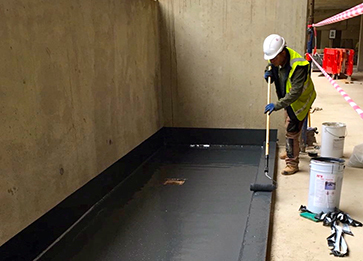 Triton’s elastomeric, liquid applied TWS-Fastcoat, has provided a rapid drying waterproofing solution for the floor slabs of the subterranean light wells at the Material Store housing development in Hayes. The slabs were constructed approximately 1.5m below ground level and, although the new concrete incorporated a watertight concrete admixture, would have remained gas and vapour permeable. Two coats of Triton’s TWS- Fastcoat, (which can be applied effectively in ambient temperatures even when substrate temperatures are as low as 0°), therefore provided an impervious barrier which will also lower the potential risks of corrosion of the steelwork in the slabs, as well as protect the outer surfaces. TWS-Fastcoat is a single pack, moisture curing, elastomeric resin. The membrane cures in a continuous and elastic form, as a totally adhered layer. It guarantees total water tightness and withstands minor building movements and vibrations. TWS-Fastcoat can be used as a base coat, a reinforcing layer or a top-coat. Other typical applications include podium decks, low pitch and flat roof areas with pedestrian traffic, wet rooms, lightly trafficked flooring, water channels and ponds. In green roof applications, the addition of Triton’s geotextile fleece between two coats provides an effective root barrier and waterproofing layer. As part of the preparation for the application of TWS-Fastcoat, Triton’s Fillet Seal was applied in 25mm beads to all internal angles that eliminates 90° angles at wall/floor transitions and minimises the risk of leaving gaps or holes unsealed. It was also important to ensure that the concrete surface was clean and dust free. On porous or friable surfaces, Triton’s TWS-PU Primer should be applied. The slabs will receive raised access floors over the TWS-Fastcoat layer, allowing any potential water/rain ingress to enter the drainage systems of the individual dwellings beneath the raised floor.